At JR Dental and Associates, we are on the forefront of dental technology by offering CEREC single-day crowns to our patients in need of dental crowns. We are highly trained and experienced in CEREC® and can restore your smile quickly, painlessly and beautifully with our in-house technology. A dental crown is a custom-made, tooth shaped covering that is placed over the tooth to restore its shape, size and strength. Crowns are used to replace fillings that are too large, cracked, worn down, or weakened teeth, cover dental implants, restore root canal treated teeth, and even cover discolored or unfavorably shaped teeth. Previously, the only restoration option available for these situations was a traditional crown. A mold was taken and sent off to a lab. While the crown was being fabricated, patients had to wear a temporary crown. Temporary crowns can sometimes be uncomfortable, may not fit properly, or even chip and crack. After several weeks, patients had to return to the dental office to have the new crown placed. The whole process took several weeks and more than one trip to the dentist. Now with the technology of CEREC®, our Jacksonville dental office can create a new crown for you in a single day. 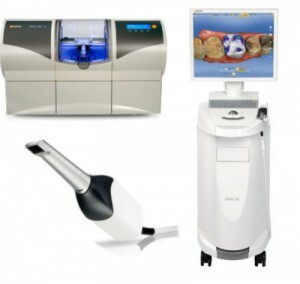 CEREC® is comprised of several computer-assisted design (CAD) tools and a milling machine that can create a custom ceramic crown within minutes. CEREC® can benefit almost anyone needing a ceramic restoration and it can also reduce the cost of treatment compared to traditional crowns. To create a crown using CEREC®, we take a digital picture to capture the dimensions of your tooth, eliminating the messy impressions. This image is used to create an individualized CAD model of your tooth. Dr. Rondon can then make any necessary adjustments before your final crown is created. This advanced digital dentistry allows crowns to be milled and restored in one single day so you can have a ceramic crown in just a single dental visit. We understand that quality, time and cost are important to you. That’s why we recommend CEREC® Singe Day Crowns. Learn more about Single-Day CEREC® Crowns in Jacksonville.